Folks, This is a Free Site and will ALWAYS stay that way. But the only way I offset my expenses is through the donations of my readers. PLEASE Consider Making a Donation to Keep This Site Going. SO HIT THE TIP JAR (it's on the left-hand column). An investigation by the International Business Times points out that during the Arab Spring the Hillary Clinton led State Department approved huge increases in "Category 14" exports to Arab countries who made similarly large donations to the Clinton Foundation. The specific category 14 exports were most probably tear gas used to quell the anti-Govt. uprisings (Category 14 exports are defined as "toxicological agents,” a broad designation that included chemical and biological weapons, as well as vaccines). For example during the uprising in Egypt as then President Mubarak was cracking down on the protesters who, with the help of President Obama drove him out of office, Ms. Clinton was publicly calling for the Egyptian govt. to restrain themselves from using violence in the crackdown. At the same time the State Dept. was privately clearing Mubarak for continued purchase of Category 14 exports. The Clinton-run State Department’s approval of chemical and biological exports to the Egyptian government increased in volume just as dollars flowed from Mubarak-linked entities into the coffers of Clinton family concerns. A group closely associated with the Mubarak government paid Bill Clinton a $250,000 speaking fee in 2010, less than 4 months before the Egyptian revolution began. In 2012, a firm with an ownership stake in the company that manufactured the tear gas reportedly used by Egyptian security forces against the uprising paid $100,000 to $250,000 for another Bill Clinton speech. The approval of American chemical weapons sales to Egypt as Mubarak’s associates were stocking Clinton family interests with cash is but one example of a dynamic that prevailed though Hillary Clinton’s tenure as secretary of state. During the roughly two years of Arab Spring protests that confronted authoritarian governments with popular uprisings, Clinton’s State Department approved $66 million worth of so-called Category 14 exports. It's important to point out that while the IBT uses the term toxicological agents, or even chemical weapons in the article, they weren't talking about illegal chemical weapons such as mustard gas, but police-used agents such as tear gas. That represented a 50 percent overall increase in such export approvals to the same countries over the two years prior to the Arab Spring, according to an International Business Times review of State Department documents. In the same time period, Arab countries that did not donate to the Clinton Foundation saw an overall decrease in their State Department approvals to purchase chemical and biological materials. The increase in chemical, biological and related exports to Clinton Foundation donors was part of a larger jump in overall arms sales authorized by Hillary Clinton’s State Department to foreign governments that gave her family’s foundation at least $54 million, according to a previous IBTimes analysis. While the IBT and other investigators can link the timing of the Clinton Foundation donations and the approval of Category 14 exports to these counties, there is no proof of a quid pro quo (there is also no proof eliminating a quid pro quo). 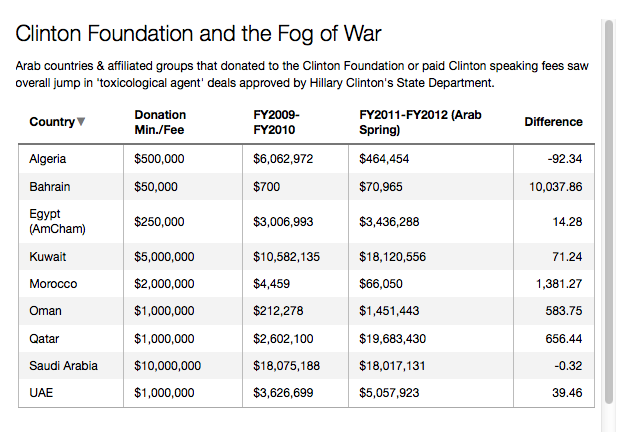 Some Clinton Foundation donors from the Middle East did not see an increase in authorizations for toxicological agents during the Arab Spring, but did see big increases earlier, soon after Clinton came into office in 2009. Algeria received just $2,110 worth of State Department authorizations in the chemical and biological weapons category in fiscal 2008. But the next fiscal year -- 80 percent of which was under Clinton’s tenure -- the country received more than $6 million worth of such Category 14 authorizations. Five-point-eight million dollars of the authorizations were for items classified as “tear gases and riot control agents.” The next year, the Algerian government gave the Clinton Foundation $500,000. Amid the Arab Spring revolts in 2011, Algerian security forces used tear gas on protesters in the capital. In a similar instance, Saudi Arabia received a little more than $5 million in Category 14 authorizations in 2008 and 2009, but then in 2010 -- Clinton’s first full fiscal year in office -- the State Department approved $18 million of such authorizations. Saudi Arabia is one of the Clinton Foundation’s largest donors, having given at least $10 million in the years before Hillary Clinton became secretary of state. If one believes in coincidences than the above means nothing, however when you add the tear gas information to all the other examples suspicious cronyism released by Peter Schweizer and others one could understand why Hillary Clinton's honesty ratings have tanked during the last few weeks. 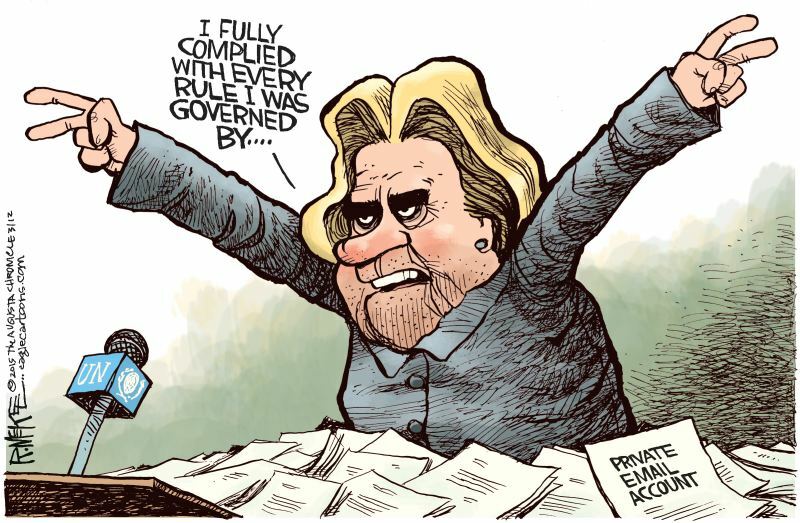 Even if there was nothing to the connections between Hillary's State Dept. and the Clinton Foundation this continual drip, drip of legitimate questions about her tenure at Foggy Bottom proves she ran State with a lack of transparency and a lack of regard for the appearance of "conflict of interest"
One thing is clear America does not need a person with that kind of character in the White House. Want "The Lid" on Your RSS Reader? Want "The Lid" Delivered To Your Mailbox Each Morning? Redemption, Exodus: Would You have been One of the One Fifth 1/5? Does the Term ‘Islamist’ Constitute Hate Speech? Report from Louisiana: Free Speech or Sexual Harassment? With the Mass Meetings Over With, Who’s Winning? Peace or Wyatt? Are National Popular Vote Resolutions Constitutional? Criminals Masquerading as Mayors in Sanctuary Cities!